A well configured flue will create sufficient up draught for a fire to function well and not spill smoke and fumes into the room. However, there are occasions where the design of a flue is not suitable for the fireplace it serves, and a chimney extractor fan may be required to create sufficient up draught. Insufficient draught in a chimney, which may be due to chimney height, airflow or various other factors, can cause your fireplace, stove or other appliance to malfunction. This may lead to your home or workplace filling with soot, smoke or even potentially dangerous carbon monoxide gas. Where there is additional ventilation to the premises or room the flue needs to work harder to clear the products of combustion. We confront this regularly in pubs and restaurants where the powerful kitchen ventilation can be reversing the usual flow of air through a chimney. A chimney extractor fan, carefully controlled and balanced against other causes of draught, can ensure that what should go up the flue does just that and the effectiveness of other ventilation is not compromised. Billing Chimneys can install an Exodraft chimney extractor fan system to solve most draught problems. Exodraft are the leading manufacturer of chimney extractor fans. Exodraft fans will work with any kind of appliance running on gas, oil or solid fuel, and systems designed for gas fires incorporate a failsafe which cuts off the gas supply to the fire if a problem develops. Exodraft chimney extractor fans are manufactured in a variety of sizes as well as in two different orientations for horizontal or vertical discharge. The speed controller unit can be hard wired and mounted near the appliance, allowing for easily accessible control of the fan. With some models there is the option of a wireless remote control. 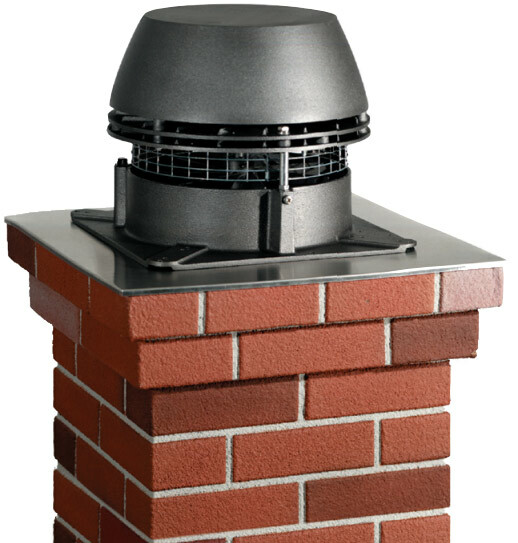 In addition to the specification, supply and installation of chimney extractor fans, Billing Chimneys also offer a routine maintenance service for Exodraft fans. To find out what Exodraft fan system would be best for your home, commercial or industrial application, please get in touch and we will be happy to help. If you have a question about Exodraft Chimney Extractor Fans, just enter your details below stating how you'd like to be contacted and we'll be in touch as soon as we can. If you'd like a member of our team to give you a call back to discuss Exodraft Chimney Extractor Fans, please just enter your details and we'll be in touch as soon as possible.